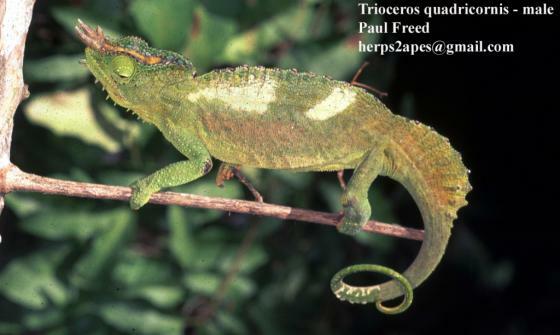 Can you confirm these amateur observations of Trioceros quadricornis? Distribution Cameroon (Manegouba Mts., Mt. Kupe, Bamboutos Mts., Mt. Lefo, Mt. Oku), Nigeria (Obudu Plateau). Elevation 1,800–2,250 m.
gracilior: Cameroon (Bamenda highlands, Bamboutos Mts., Lefo, Oku), Nigeria (Obudu Plateau). Elevation 1,800–2,400 m; Type locality: Mt. Lefo Massiv 1800 m, West Cameroon. Type locality: Kamerun, (restricted fide KLAVER 1981:44): Manengouba Berge, Kamerun. Types Lectotype: ZMB 14957 (fide MERTENS 1959: 114, non BOHME & KLAVER 1981: 317; fide KLAVER & BOHME 1992: 463). Comment PERRET (1957) describes some female C. wiedersheimi that were actually C. quadricornis. Subspecies: Trioceros quadricornis eisentrauti (MERTENS 1968) is considered as a valid species by most authors. Etymology Named after the four horns the species displays. Trioceros quadricornis eisentrauti (MERTENS 1968) has been named after Martin Eisentraut (1902-1994), German zoologist.